Election night 2011 was full of surprises. The fact that some of the outcomes were surprising suggests many factors influenced voter behavior, and without detailed post-election polling, explanations have been at best speculative and at worst self-serving and emotional. But with the certification of election results by the ad hoc City of Boulder canvassing board on Tuesday, November 15, we now have the final numbers to analyze. This opinion article is intended to provide a fair analysis and interpretation of this important election. It is based on the election outcome, first-hand observations, websites and election materials, council candidate forums, and long-term study of Boulder elections and politics. Surprise number one in this election was the top-polling overall victory of Boulder City Council candidate Suzanne (Zan) Jones. Political veteran Jones (Environmental Advisory Board, Blue Ribbon Commission II on Revenue Stabilization, PLAN-Boulder County board member, Regional Director for The Wilderness Society) ran an excellent campaign with a strong focus on the issues, but it is still unusual for a first-time-candidate to gather the most votes for council. The most logical explanation is that Jones is an engaging candidate and that her positions on the issues strongly appealed to the people of Boulder. Her positions (zanjonesforcouncil.com) emphasize preserving what’s best about Boulder, creating a sustainable energy future, improving local and regional transportation, creatively enhancing our downtown area, and investing in our infrastructure. Lisa Morzel, who is completing her twelfth year on council, finished strongly in second-place and now will serve another four years with a huge affirmation from the people of Boulder. 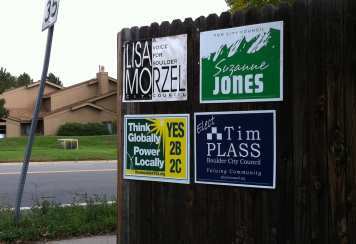 Morzel’s positions on the issues (lisamorzel.com) highlight progressive and environmental values, with strong emphasis on exploring municipalization as a pathway to clean reliable energy, creating new bikeways and crosswalks, developing our civic space at the St. Julien, acquiring and carefully managing open space, preserving “Section 16” to complete the Rocky Flats Wildlife Refuge, and creating the long-awaited north Boulder library branch. Tim Plass, Planning Board member, former Landmarks Board member, and community activist finished in third place. Plass supports many of the positions advocated by Jones and Morzel (plassforcouncil.org – now taken down). All three of the top winners were endorsed by PLAN-Boulder County, the Sierra Club, the Daily Camera, and the Boulder Weekly. All three are strong environmentalists, advocates of careful land-use planning, supporters of the Boulder municipalization issues (ballot measures 2B and 2C), and strong advocates for the Move to Amend ballot measure 2H (opposing corporate personhood). 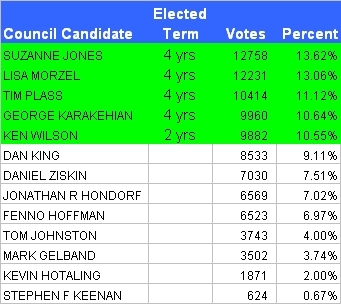 The second surprise of election night was the relatively weak showing of incumbents George Karakehian and Ken Wilson, who trailed Jones and Morzel by 2400-2900 votes (22-23%; see chart and table). Incumbents are usually golden in Boulder and, whereas both retained their seats, it is striking that they were displaced from the top of the ticket by two newcomers with relatively low name recognition. This is important. Both Karakehian and Wilson have served well and are competent councilmembers, but both opposed 2B/2C as did the conservative groups who endorsed them (Boulder Area Realtors Association, Boulder Outdoor Coalition, and Boulder Chamber of Commerce). Finishing significantly behind the electeds (1336 votes behind Wilson), Dan King’s campaign started strongly but faded in the end, perhaps due to his close ties with the Chamber, his opposition to the 2H issue, his opposition to dedicated taxes (like open space, recycling, and climate action), or his seeming ambiguity on 2B/2C. Or perhaps Dan’s thin knowledge of city issues other than the budget came through in the long stream of forums and questionnaires. Daniel Ziskin and Jonathan Hondorf came next, finishing ahead of 2-time candidate Fenno Hoffman. King, Ziskin, and Hondorf are likely to be strong candidates in the next council election, if they choose to run again in two years. It’s tempting to speculate that the 2B/2C victories lifted Jones, Morzel, and Plass to decisive victory, but the narrow margins of the municipalization issues suggests other factors were at play. Rather, the high vote tallies of Jones/Morzel/Plass seem to be a confirmation of the vision of the current council, which includes supporting strong environmental action and open space conservation, careful development when it provides a distinct community benefit, a strong social services network, and encouraging innovative and locally-grown businesses. Some have speculated that anti-incumbent sentiments influenced this Boulder election (Daily Camera, Nov. 3), but two outcomes argue against this hypothesis. The very strong showing by incumbent Lisa Morzel suggests the results are related more to the issues and positions championed by Morzel as opposed to the more conservative positions of the other incumbents, Wilson and Karakehian. Further, the very weak showings by Mark Gelband and Thomas Johnston, both of whom were relentlessly critical of the current pathways chosen by Boulder leadership, shows that anti-incumbent sentiment is not important in Boulder at this time. The third surprise was the narrow victory and last minute surge of support for 2B (50.40%) and 2C (51.93%), which will enable further study and consideration of municipalization of our electrical energy supply. These issues pitted liberals and environmentalists who believe in clean energy and local government against conservatives and others who argued that they have a better chance of influencing Xcel or the PUC (Public Utilities Commission, which regulates Xcel in Colorado) than their own elected officials. 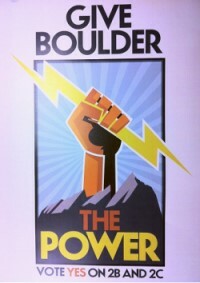 As the campaign progressed, many voters were offended by the steady stream of distortions and half-truths that Xcel and its proxy (Boulder Smart Energy Coalition) produced. The anti-2B/2C groups spent at least $900,000 to protect the current regulated monopoly, about ten times the amount spent by the pro-2B/2C groups. Perhaps a primer on how democracy works is in order, but I guess Xcel has already received that. The election outcome, with both 2B and 2C passing, and 2H passing by an overwhelming margin (73.79%), shows that Boulder residents still possess highly functional BS detectors. Significant credit needs to be given to our local newspapers (Boulder Weekly, Daily Camera, and Denver Post), who stood up to intense pressure and endorsed the municipalization ballot measures. The narrow passage of 2B/2C with a strong surge at the end was clearly lubricated by incredibly intense and effective campaigning all the way to the end. This effort was led by New Era Colorado and the Boulder Clean Energy Business Coalition. Volunteers from RenewablesYes and the Sierra Club participated in a massive and successful get-out-the-vote campaign at the end, which produced a last minute surge that carried 2B/2C over the top. The challenge of the municipalization issues was educating the voters, and the margin would probably have been larger if the clean energy campaign had had the resources to reach more voters. The most important take-home message of this election is that Boulder voters are happy with the city and support the direction the City Council has taken us in the last four years. Boulder citizens want our city to be a national and international leader in drastically reducing greenhouse gas emissions, and they believe that municipalization may be our best chance to achieve that goal. But issues of Open Space conservation and environmental preservation, and a careful, measured approach to development should not be underestimated as issues that propelled the top 3 vote-getters.